During World War II, while physicists and chemists worked to develop the atomic bomb and improve synthetic rubber, microbiologists at the newly established Northern Regional Research Laboratory (NRRL) in Peoria, Illinois were tasked with figuring out how to mass-produce penicillin. This drug, prized for its high toxicity to bacteria (at least those not resistant to it) and low toxicity to humans, was discovered by Alexander Fleming in 1928. 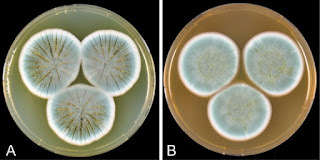 He isolated it from a blue-green mould (essentially a low-rise fuzzy fungus) he found growing in a dish previously filled with a nutritious gel and sown with a bacterium. Crucially, Fleming noticed the errant fungus (a member of the genus Penicillium) was inhibiting the growth of the bacterium, leading him to look for the agent responsible for this effect. About a decade later, a team of researchers at Oxford carried out a series of investigations that confirmed the ability of penicillin to cure bacterial infections in lab animals and people. Thereafter, two of the researchers (Howard Florey and Norman Heatley) moved to Peoria to help with scaling up production of the drug, as the war-focused British industry was unable to spare resources for this task. As penicillin is not easily synthesized from chemicals in a laboratory, it has to be harvested from the mould that makes it. Scientists at the NRRL soon realized the particular strain of Penicillium isolated by Fleming wasn't up to the task. Although its penicillin yields could be slightly boosted by putting it on a diet of processed corn and lactose, Fleming's strain only produced appreciable amounts of the drug when cultivated on the surface of a nutritious gel as opposed to grown submerged in a nutritious liquid. As the latter is a much better way of obtaining massive amounts of a penicillin-making fungus (and thus penicillin itself), it was clear that another strain was needed. After making do with a slightly improved fungus (NRRL 832) found among the several dozen strains of Penicillium in the NRRL collection at the time, the decision was made to broaden the search. Over the course of 1943, a menagerie of fungi was assembled from samples acquired by Air Force personnel during their travels all over the world. Hilariously, even with all this effort, the researchers found their champion mould munching on a cantaloupe in a fruit market near the laboratory. Strain NRRL 1951, as the melon eater came to be called, is the ancestor of most of the strains used for the industrial production of penicillin today. When grown submerged, NRRL 1951 produces approximately 100 units of penicillin per mL of liquid. By growing up a bunch of NRRL 1951 and letting it naturally undergo spontaneous mutations, a variant able to make 250 units/mL (NRRL 1951.B25) was obtained. Yet the penicillin industry wanted more, turning to artificial means of enhancement. In 1944, projects were established at several US research facilities to further improve penicillin production. At the Carnegie Institution, millions upon millions of spores of NRRL 1951.B25 were bombarded with X-rays. While this proved fatal to most of them, thousands of spores still survived. One of these germinated into a super strain by the name of X-1612. It's capable of making more than 500 units of penicillin per mL. Building on this, researchers at the University of Wisconsin zapped X-1612 spores with ultraviolet radiation. This resulted in the creation of strain Q-176, which pumps out over 900 units/mL. Nature successfully hacked! Thus, in just under two years, penicillin yields by a fungus were increased ninefold across several generations (1951 -> X-1612 -> Q-176). This permitted the drug to be manufactured relatively cheaply on a massive scale, leading to a drastic reduction in the impact of bacterial infections on human health.